Improbably, the global economy has returned to growth over the past four years despite the ravages of a deflationary debt collapse, a punishing oil shock, ongoing constraint from debt and deleveraging, and stagnant global wages. 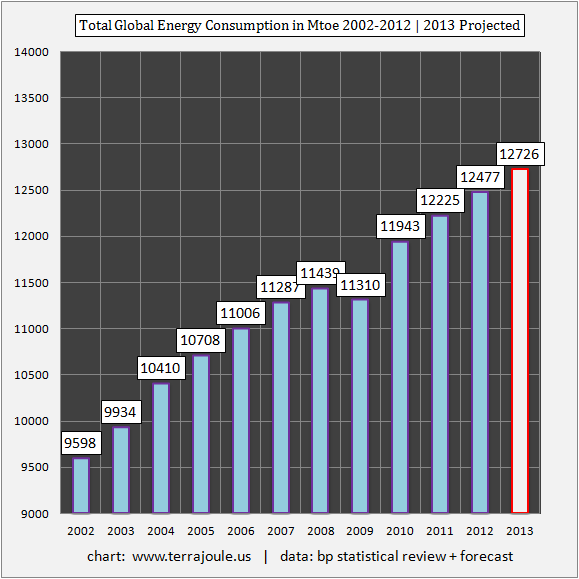 The proof of this growth comes from the best indicator of all: the growth of global energy consumption. Halted in 2009, as global trade collapsed from the second half of 2008 into the first half of the following year, the global demand for energy inputs quickly returned to its long-term trend in 2010, growing at approximately 2% per year. Ecological economics holds that human economies are subordinate to the availability of natural capital. Technology therefore does not create natural resources, nor does human innovation. Instead, technology and innovation mediate the utilization of existing natural resources. In other words, an improvement in the techniques of longwall coal mining (late 1700s), deepwater offshore oil drilling (late 1900s), and horizontal natural gas fracking (early 2000s) are all impressive. But these innovations only matter when the prize of dense energy deposits are actually on offer. No dense energy deposits = no value to innovation. We are therefore obligated to acknowledge that when few natural resources exist or are too expensive to extract, very little economic activity is possible. Conversely, we are equally obligated to admit that when resources are available for consumption, then growth will likely result. And lo and behold, that is precisely the explanation for the world’s return to growth since the collapse of 2008: Despite the punishing repricing of oil from $25 earlier in the decade to $100, there was enough energy from other sources to get the global economy back to some kind of growth. Of course, this is not the smooth and well-lubricated growth that many in the West had become accustomed to in the post-war era. The nature of today’s growth is highly asymmetric between East and West, and highly imbalanced between rich and poor. Today’s growth is also quite lumpy, or highly clustered, as certain domains and regions are benefiting while other populations are living in very stagnant conditions. We’ll get to these details shortly. This chart is bad news for the many observers on all sides of the macroeconomic equation who are trying to puzzle out the post-crisis era. The fact is, there is enough energy to fund traditional, industrial economic growth in the phase after Peak Oil. Yes, the end of cheap oil did indeed shock the system, and along with the previous credit bubble, it has cast a pall on the potential rate of global growth. But many of the forecasts about the absolute end of growth have yet to come true. This is important because while the global economic system was highly sensitive to an oil shock coming into 2007, it is actually less sensitive now to an oil shock. Those who, ten years ago, correctly predicted the tail risk that oil presented to the system should declare victory. Equally, forecasting a repeat of that experience is probably unwise. Why? Simply put, whereas oil used to be the key commodity on which a fast, just-in-time, high-functioning global economy depended all too much, now a combination of coal, natural gas, and other inputs to the power grid have taken nearly all of the market share over the past decade. It is axiomatic, therefore, that if the global supply of oil has only increased from 74 mbpd (million barrels per day) in 2004 to 76 mbpd here at the end of 2013, but total energy consumption globally from all sources has risen over 20% in the same period, then nearly all the growth in the global economy is being funded by other forms of energy. So you can abandon the idea there will be a future oil crash – because we already had it. 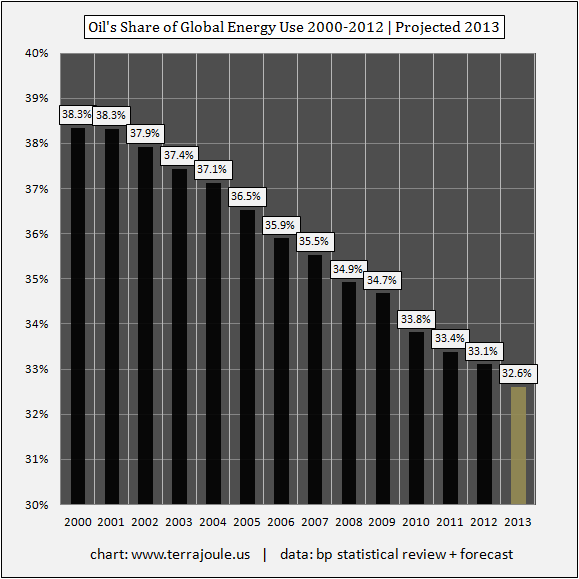 The world has been busily starting to wean itself off oil for nearly ten years now. Oil use in Europe and the United States peaked in 2004-2005. The decline of oil consumption only accelerated after 2008, and in the OECD, it's still declining. Will $125 or $150 oil crash the economies of Japan, the United States, or Europe at this point? Perhaps not. There is hardly any growth to crash in the OECD. It is as if the OECD economies are effectively bunkered, with no growth in wages, jobs, or construction, and nearly all progress is confined to asset prices, mainly the stock market. Perversely, this stagnation is the new strength. Meanwhile, in the Non-OECD, where growth is actually taking place, the big drive that has taken world energy use higher since 2008 – from 11310 Mtoe in 2009 to this year’s projected 12726 Mtoe – continues to be funded by natural gas, various inputs to the power grid, and the world’s still fastest growing energy source: coal. Yes that's right, coal, which grew 2.5% last year. Again, ecological economics informs us that there must be energy inputs to fund economic growth. Well, the world has plenty of energy inputs in the form of natural gas and coal. There is no Peak Natural Gas and there is no Peak Coal. No crash is coming in either of these resources in the foreseeable future, either. We would not say that the global economy is currently at high risk of losing its access to coal. So we should no longer be overly concerned that the global economy is going to lose its access to oil. It has already lost its access to cheap oil. And now coal, not oil, is in position to take the lead as the number one energy source, globally. But there is little room for complacency in this regard. Because there is little good news in this lower tail risk from oil and its lower-level threat to the global economy. Rather, the global economy is growing increasingly imbalanced. We can think of reflationary policy from Europe, the U.S., and especially Japan as an attempt to counter the West’s loss of access to cheap oil. Is that policy working? Not really. The primary beneficiaries of this policy have largely been corporations, which derive most of their growth from the 5 billion people in the developing world but are located in the OECD. These corporations are sited in London, New York, Tokyo; the cash from worldwide operations rolls in, but they have little need for expensive, high-wage Western workers. Accordingly, stock markets in the West, composed of these corporations, continue to soar, while investment and growth in the OECD stagnates. 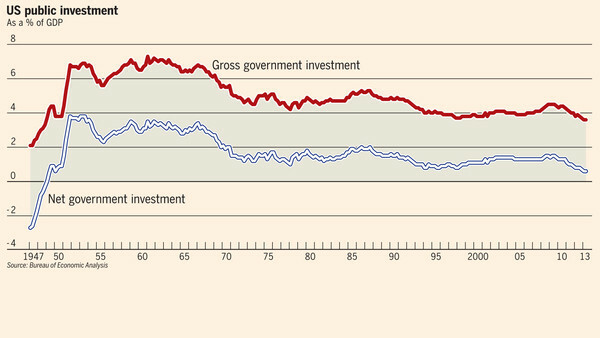 The global capex cycle appears to be stalling even before it has fully got under way. In real terms, capex growth for our sample of nonfinancial companies slowed in 2012 to 6% from 8% in 2011. Current estimates suggest that capex growth will fall by 2% in 2013. Early indications for 2014 are even more pessimistic, with an expected decline in real terms of 5%.... Worldwide, capex growth has become increasingly reliant on investment in the energy and materials sectors. Together, these sectors account for 62% of capex in the past decade. This reliance creates risks. If the global commodity "super cycle" is fading, global capex will struggle to grow meaningfully in the near term. Sharp cutbacks in the materials sector are a key factor in the projected slowdown in capex for 2013 and 2014. Notice that the total volume of global capex is increasingly reliant on investment in the very capital-intensive energy and materials sector. This is highly revealing. In the aftermath of oil’s repricing and the repricing of many other natural resources, the global natural resources sector now requires significantly more investment to extract the same units of oil, copper, iron ore, coal, natural gas, and potash, and requires more expensive technology and more human labor. This is the sector holding up the average spend of global capex, so we can conclude that beneath that average, the capex in typical post-war industries like media, finance, real estate, and even infrastructure is not only low, but historically low. The very poor level of employment growth confirms exactly this conclusion. Most poignant of all, this is a wildly strong confirmation of ecological economics, showing that a larger and larger proportion of total investment needs to be devoted now to natural resource extraction, leaving less investment to other areas. The net energy available to society is in decline. When neither the private nor public sector is willing to invest in the future, it seems appropriate to ask, what happened to the future? Have corporations along with governments figured out that a return to slow growth does not necessary equal a return to normal growth? Why invest in new infrastructure, new workforces, new office space, equipment, highways, or even rail, when the demand necessary to provide a return on this investment may never materialize? In Part II: Why Social & Environmental Imbalances Are Becoming the Biggest Risks, we explore how the misguided policies being pursued worldwide to return to the growth we've been accustomed to are resulting in a volatile mix of imbalances in both wealth and resource availability. As we move further into a future defined by less per capita – not more, as we've become accustomed to – dangerous rifts in our social fabric (both within and among countries) threaten to define the days ahead. This article is frightening in considering the climate and environmental costs of rising energy use from sources even more damaging than oil, as well as the mere fact that we are unlikely to see any significant decrease in the emissions of CO2 in the near future Increasing evidence suggests that even in the US where methane release may actually be a concern, methane release from natural gas may outweigh the supposed climate benefits. Coal is an environmental nightmare all of its own starting with extraction, the inefficiency of it as an energy source, and the damage caused by the pollution. Perhaps the consequences of climate change, economic and otherwise, will wipe us out before peak energy does. As U.N. climate talks continue in Warsaw, Poland, scientists and a top U.N. climate official issued a stark warning to the coal industry on Monday: close existing, inefficient plants and implement technology to capture and store emissions of planet-warming greenhouse gases at all new power plants, or risk accelerating global warming to potentially catastrophic levels. I'd never heard of the author and found some of his claims re: energy to be preposterous, so I thought I'ld look him up. Here's what I found. "Gregor holds a B.A. in English and Social Anthropology from Denison University, and an M.F.A. in Creative Writing from the University of Iowa Writer’s Workshop. He has worked in Land Use/Environmental Law in Boston; the Television Commercial Production industry in Los Angeles; and in research at the University of California. “Alot of the work I’ve done in the past twenty-five years turns out to have centered around land, landscapes, and cities.” Gregor has also spent time teaching. In particular, advanced English for immigrant professionals in Massachusetts, and creative writing for children through the Royal Parks Education programs, in London. - See more at: http://gregor.us/about/#sthash.8OTGyYCV.dpuf"
Next, I Googled him. Max Kesier, Peak Prosperity, SeekingAlpha some one off blogs, nothing of substance...the usual suspects. So this is what Peak Prosperity is. My skeptical friends were correct. Shame on me. OK. Lesson learned. Ciao. Gregor is a long time respected member of the PP community. If you have some supported critique of his analysis then bring it. Ad homs are not generally respected here. What happened to the future? is the most intelligent and helpful writing I have found on this site so far. I obtained new insight that I never thought of before and appreciate Gregory's efforts. I don't give a rats a** what stupid degree Greg or anyone has,especially since modern education is bestowing fancy sounding degrees on people who don't even learn the basics. Self-motivated education is best, and is the way to future prosperity anyway. But Yahoogle is right to bring up this issue, contributes a real concern about education, and I welcome his interest as very helpful. Gregor obviously has become very educated despite a dispensory system where you put in your money and time in and get a fancy name, courtesy of "experts" who (in most instances) are completely out of touch with the world we live in. Our education system is broken and one cannot relay on "credentials" anymore. I'm not sure what's so preposterous; everything he says is well rooted in reputable data and he's pulling it together in an accurate way, as he always has. Is it because you aren't willing to open up to accepting the facts because they run so counter to everything we're being spoonfed from the mainstream media? Mother Culture's whispered promises are strong, and Yahoogle's protests likely have more to do with the fact that he (she) doesn't want to see any truth other than the one he/she has been taught all of their life: that the world was made for humans, and humans were made to rule it. (A Daniel Quinn reference, for those who didn't catch it) I've never ceased to be amazed at how many of my peers, students, and friends seem to intuit "dangerous crises incoming," yet are incapable of discussing it or even entertaining the thought that the future will be anything other than eternal and ever-growing prosperity. So it is with paradigms. I'm a teacher of history at a local private high school who has done well over 200 hours of reading and research into Peak Oil, from a multitude of official and unofficial sources on the subject. Does my degree mean I don't have any idea what I am talking about, or does my dedicated learning on that subject warrant some level of respect from others who have done far less learning on the topic? How one answers that question will determine who they listen to. Clearly Yahoogle wouldn't. Maybe someday he/she will, and maybe she/he will start preparing for a less clear future. That's my hope. Ad hominem attacks try to distract from the argument by supposedly undermining the person making it. In reality they reveal the attacker as someone unwilling to address the argument itself, for whatever reason. I don't know who Gregor is, and I don't really care (sorry, it's not personal!). I am interested in the argument alone. The rise of coal is truly scary. Some suggest that fracked gas will provide a transitional fuel, with lower emissions, while we get our act together over renewables. There are problems with this: 1) We do not wean ourselves off fossil fuels, and delay the changeover to renewables 2) Total emissions from fracked gas may be much higher than advertised, and 3) Fracked gas may turn out to be a giant Ponzi scheme. So what happens when fracked gas turns out not to be the game-changer everyone has pinned their hopes on? We quickly slide further down the net available energy curve, and depend even more on coal. In the meantime we will not have invested enough in renewables to provide any sort of solution without serious cutbacks in energy consumption and/or runaway climate change. As net available energy declines, even less becomes available for the techno-fixes that many believe will be our way out of the mess. Thanks for the analysis, Gregor! A while ago I looked into making my own inflation statistics since I don't trust CPI, and I am concerned that Shadowstats may not be moving with the times, and underestimating the contributions from technology. Methodology from the 1970's may not be 100% applicable to today. I didn't get very far since I have a job and tons of other stuff to do, but maybe I'll pick it up again (it's not rocket science to develop an inflation adjustor, despite what TPTB would like you to believe). I also determined that it's very wishy-washy to attempt to assign a single inflation adjuster and say, "The cost of living has gone up by x.x% in the last y years", since there are so many subjective assumptions and decisions that need to be made to come up with that number that don't have clear black and white answers. There is no single "real" inflation adjustor number. It's probably better to have a range. Which is why all the mob investment community poring over every decimal point of the published CPI to make their risk on / risk off decisions seems so ridiculous, as if the number means anything. Anyways, I looked into it and found a book that listed historical prices for many important items going back a hundred years, sorry I cant remember the name, I can retrieve it if anyone is interested. I was amazed that the price of coal has stayed the same nominally for around a hundred years (don't quote me on that; I'm going by memory). Coal is way cheaper now than it ever has been. This may be why many coal mines close; not because they are out of coal, but because it is so cheap. There may be a lot of coal out there and our future may be fully derived from it. You can make oil from coal, at the expense of a low EROEI and all the other nasty environmental and social externalities. You should see the dross that is offered up for my contemplation by Youtube. The internet offers an opening for every point of view. A lot of chafe has to be separated from a very small amount of wheat. But I continue to search for the nuggets, for one seemingly trivial idea can have astounding consequences. "If I wave this here magnet over this wire, that there compass needle moves!" "Thats nice dear. Now come and have your supper." Imagined conversation of Faraday with his mother. Gregor says in his byline that "net energy per capita declines." From data I read from The World Bank, net energy use globally per capita actually INCREASED 10% from 1990 to 2008. Where is his data coming from? Is the more recent data different? Even if this is so, why does that necessarily correlate to a decline in economic output? I mean to say, isn't it possible that we are now more EFFICIENT in energy usage than we were before, thus getting the same economic output for less energy input? I mean, just look at fuel economies of automobiles. With an off the shelf Prius getting 50 MPG today, you now can move the same amount of physical goods in trade as you could ten years ago with a 30 MPG Honda Civic--- but get 66% more bang for your buck--- moving those items 66% farther on the same energy input. That is just one example. I look forward to any reasonable reply. "As we move further into a future defined by less per capita – not more, as we've become accustomed to – dangerous rifts in our social fabric (both within and among countries) threaten to define the days ahead." I would like to know what data he is using to make the conclusion that we will move into a future defined by LESS per capita. From what I've read on solar and wind projections, sometime in the next two to four decades we may in fact have MORE energy per capita available to us than we know what to do with. I'm not saying he's wrong. I'd just like to be directed to the data. Gregor has been writing brilliant, data filled posts for many years on these subjects, mostly on gregor.us and now here on Peak Prosperity. He's reasonable, unbiased, and open to discussion, argument, and learning new things. Your statement that his writing is "nothing of substance" surely demonstrates only your own ignorance. It might be more constructive to tell us exactly which of his claims are "preposterous" and then give us data supporting WHY they are such. Gregor says in his byline that "net energy per capita declines." From data I read from The World Bank, net energy use globally per capita actually INCREASED 10% from 1990 to 2008. Maybe I'll take a stab at it, I hope that's OK. He actually said "net energy available to society declines" which I presume means that the proportion of the total energy used by society that is required to pull more energy out of the ground and get it ready for use increases, leaving less of the proportion left over to build schools, etc. That is what is declining as EROEI drops. So a greater and greater workforce is required to provide energy just to keep society moving along. It's a bit of an ambiguous term because globally I think net energy use per capita is still up, but in the US it's down. And Gregor predicted that in the future, net energy per capita will decline, which I agree with. Even if this is so, why does that necessarily correlate to a decline in economic output? I mean to say, isn't it possible that we are now more EFFICIENT in energy usage than we were before, thus getting the same economic output for less energy input? There are efficiency limits for energy conversion that will put a lid on innovation, which is what the "Carnot Limit" is that I'm always harping about. It may be true that if everyone switched to a Toyota Prius tomorrow, gasoline demand would halve overnight, but think about how much energy would be required to manufacture 200,000,000 Prii (?). It would pretty much negate any fuel savings. Furthermore, it seems the US will soon lose its reserve currency status, meaning that its oil imports will end, which means oil use will have to drop by half. That would eat up all the savings from switching to Prii. And the Prius is at about the thermodynamic limit for converting gasoline into movement of a car down the road; you really can't practically get any better than that until we switch to fully electric cars, which we are nowhere near capable of achieving in size in time. Also, not all oil use is for burning as gasoline; much of it goes into feedstock for making pretty much everything else in the economy, and there aren't really many opportunities for efficiency advancements there. I suppose coal could be used instead, but that would take a while to sort out and it wouldn't be as cheap as oil. Also, as EROEI drops, the efficiency of extracting further fossil fuels will decrease, not increase; which is the opposite of what we're told technology is doing for us. From what I've read on solar and wind projections, sometime in the next two to four decades we may in fact have MORE energy per capita available to us than we know what to do with. If the currently exponential trends in solar and wind growth continued we would have that much energy; but I don't think they will. Exponential growth is easy at the small scale but is much harder to sustain when it becomes a significant chunk of the energy mix. Wind's potential is over-hyped in my opinion. Solar has huge potential but has many practical hurdles preventing it from taking over the majority of electricity production (mostly due to weather and daily variability). But you may end up being partly right if coal turns out to be as abundant as some think it might be. We could make oil from coal, and electricity from coal + solar. But it will be expensive energy, even if it's abundant, so that will constrain economic activity. But our infrastructure isn't set up for that and here in Canada they are doing everything they can to convert away from coal. They are switching to burning biomass, if you can believe it. So we should be moving towards "clean" coal, solar and possibly nuclear, and away from biomass, natural gas and oil, but that is the opposite of what we're actually doing. Lula was no reformer; he merely kept the course set by his predecessor, Fernando Henrique Cardoso, a renowned sociologist with a focus on economics, whose tenure, first as economy minister and then twice as president, launched Brazil out of a decades-long stupor rooted in inflation. The only innovation bright about by Lula, a middle-school drop out lathe operator, was the unprecedented corruption scheme commanded from his cabinet. But he was a populist and managed to be reelected and make his successor, Dilma, his chief of staff and former guerrilla who's never had an elected office before. This is easily answered. It's your time frame. If one goes back to 1990 that was before Pres. Clinton made the biggest economically treasonous act in US history by granting Permanent Normal Trading Realtions to China. So, part of your time frame includes the huge increase in energy by an industrializing China. I only hope that your post was not intended to deceive us. There are lots of places where we are getting less per capita and the data is quite easy to come by. Arable farmland. First, the amount of arable land is fixed and second it's being steadily degraded/lost over time. Oceanic fish stocks and resultant harvests. Potable water, especially in water poor regions. Net energy from crude plus condensate (traditional oil) as new, lower net energy forms of it replace prior stocks and flows and as population growth exceeds new oil production (since 2005). In short, anything that is not expanding by the rate of population growth (~1.2%/yr) is declining on a per capita basis, and that's a lot of things. Even with something like coal, where there's a whole lot left and we are mining more each year, we find that the grades of coal are declining and/or the new deposits are deeper and/or thinner, requiring us to put more effort into procuring each new additional unit of energy. This means that up until about 1970 -1980, somewhere in there, humans always had more and better stuff to use which provided a great tailwind. Since then we've been 'nosing over,' and that tailwind is in the process of quartering, about to become a headwind. And dirtier. I understand that the discussion you are addressing is essentially a statistical one. But, I would suggest that any discussion of energy include environmental effects. Perhaps regular inclusion of externalities will gradually raise awareness of the many environmental predicaments resulting from fossil fuel use. As mentioned, in the US this has actually been dropping, but globally is has been RISING. I don't know what you mean by my post being "intended to deceive us." Confused about that one. Even with something like coal where there's a whole lot left, and we are mining more each year, we find that the grades of coal are declining and/or the new deposits are deeper and/or thinner, requiring us to put more effort into procuring each new additional unit of energy. This means that up until about 1970 -1980, somewhere in there, humans always had more and better stuff to use which provided a great tailwind. Since then we've been 'nosing over' and that tailwind is in the process of quartering about to become a headwind. I can't argue with Chris on any of this very much. However, my question was SPECIFICALLY about per capita energy use ONLY. The data I've read does not correlate with what Gregor stated, that per capita energy use is FALLING. Where is the data that shows that? What I found actually shows the opposite. (I do have a quibble with the arable farmland point. While obviously if we don't increase the net number of acres we farm and yet population increases, then acres farmed per capita declines. However, we have been increasing farmland YIELDS for decades. See the following graph. In 1980 we were producing about 100 bushels of corn per acre in the US; in 2010 we produced 165, a 65% increase in 30 years. US population has not increased by 65% in the same time period, so, actually, we are now producing more corn per person in the US than we were 30 years ago, by a wide margin. My conclusion after reading Gregor's article again is that his main point is in this sentence he wrote: "The NET energy available to society is in decline." The data I found is, perhaps, presented as a different thing. While total energy used per capita is actually INCREASING, this does not present NET energy used per capita AFTER accounting for the energy you used to get the rest of the energy. In short, EROEI is declining even while TOTAL energy per capita is increasing. I'm not actually SURE this is what Gregor meant, but it's my best guess.